Part of the coffee ceremony. Photo by T. Tian. If you’ve never tried Eritrean food before, Mosob in Westbourne Park is the best place in London to start. And if you have, it’s an excellent place to continue. 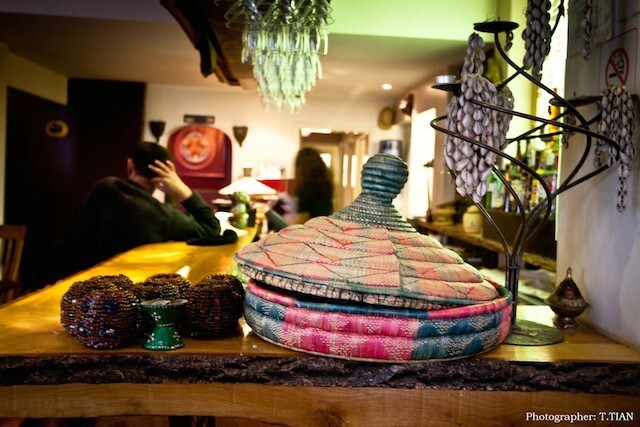 We’ve been visiting this charming restaurant since it opened 10 years ago, and have always found something new to taste or learn – for not only do you get food here, you also get an education in Eritrean culture and cuisine. And that’s even before you get to the legendary coffee ceremony. 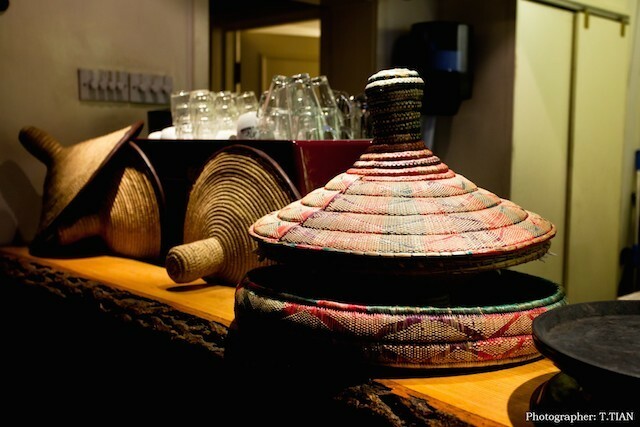 Mosob – the word for the low, hand-woven African table on which a meal is shared – is owned by three siblings of the Abbay family. Brought up locally, they started the restaurant to occupy their mother who’d newly escaped war-torn Eritrea, initially selling only her 'injera' bread. This is the renowned soft, pliable, flannel-textured flatbread of Eritrean and Ethiopian cuisines, somewhere between a French crêpe and a south Indian dosa, its surface dotted with tiny holes. Originally made from the fermented batter of a tiny grain called teff (touted as 'the next quinoa' by trend-watchers), here it’s made from wheat and maize flours as they can’t find a regular supplier of the grain, and anyway the hard British water means that teff injera may crack. The family venture gradually turned into a proper restaurant, with Mum doing the cooking for the first six years, and one of the brothers taking over in the last four. Everyone dining at Eritrean and Ethiopian restaurants wants to know what the difference between the two cuisines is, as they were both the same country until the 1990s. 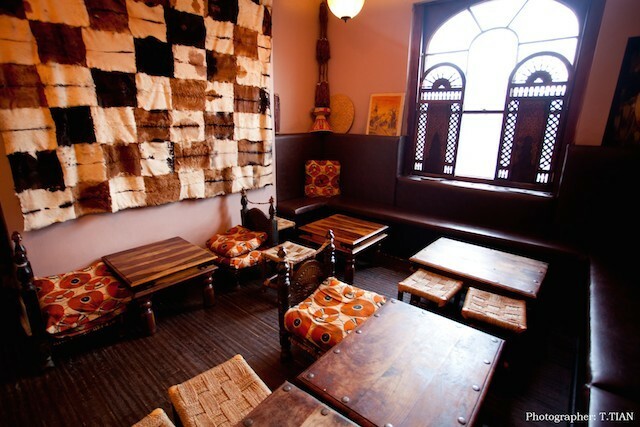 Eritrean food is influenced not only by Ethiopia, but also neighbouring Sudan, Somalia and Saudi Arabia. As Eritrea was once an Italian colony, they use more tomatoes than Ethiopians; and local versions of Italian classics like spaghetti and tiramisu are also popular. There are ‘wats’ or ‘tsebhi’ (stews, sauces and purées) to be found in both cuisines, but Eritrean ones are lighter, the spicing is subtler, and ‘aged butter’, a condiment used as a flavouring, is less pungent. Some of the dishes and the spices used do vary – but, to be honest, unless you’re an expert in the two cuisines, you won’t notice a difference. The best vegetarian food around the world is often found in vegetarian traditions that are rooted in either poverty or religion – and Eritrean (and indeed Ethiopian) cuisine is no different. 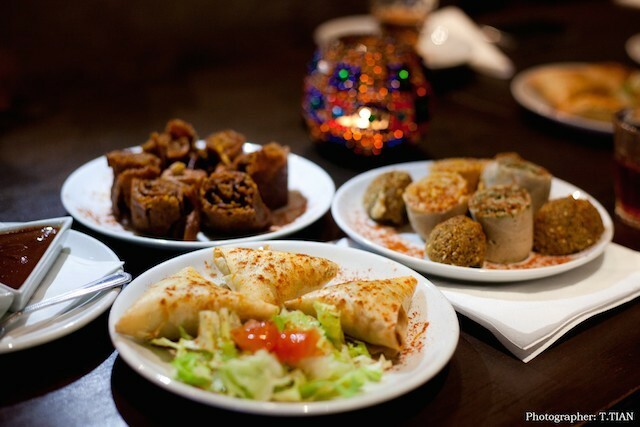 Only meat-free dishes are eaten by Coptic Christians on their very many fast days throughout the year; and here, there’s a great choice of vegetarian starters, a separate section of vegetarian mains, and three multi-course vegetarian set menus priced between £27.95 to £ 36.95 for two. We plumped for the mid-range option of £32.95 for two, which works out significantly cheaper than ordering all the dishes separately. To start, there’s injera stuffed with two different sauces – spinach and lentil – rolled tightly, and prettily cut like a swiss roll. The spicy sauces are a delicious contrast to the distinctly sour tang of the bread (which is always served at room temperature, not warm). Soft, earthy chickpea and broad bean falafel has a good depth of flavour, and is halved and served with two dips: thick, creamy yoghurt drizzled with paprika and olive oil, and the classic ‘awaze’, a brick-red chilli pepper paste that’s spicy but not too hot. Next, a large stainless steel platter comes lined with injera, on which the ‘tsebhi’ or ‘wats’ are dotted around in complementary colours, flavours and textures. There’s fresh spinach with fresh white cheese (somewhat misleadingly described as ‘cottage cheese’ in Eritrean restaurants), the minerality of the greens a perfect foil to the mellowness of the dairy. Then there are are mashed golden-red spicy lentils, and chunkier whole green ones flavoured simply with garlic and turmeric. More garlic features in a dish of miniature okra cooked with cumin-spiked fresh tomatoes. Even more colourful is a mildly spiced dish of cabbage, carrots and split peas. There’s also a simple, perky little lettuce and tomato salad; and extra rolls of injera are supplied. The food is hearty, homely and robust; packed with flavour, it’s also wholesome and nutritious. Sharing food – which here goes far beyond the ‘small sharing plates’ concept of trendy London restaurants – is deeply ingrained in Eritrean dining. So the food platter is placed in the middle of the table, and the idea is for everyone to dip in and share. Yes, it does involve eating with your hand. If you find that tricky, there are diagrams on their website, and one of the witty, charismatic siblings who works front of house will give you a demonstration. Vegetarians and omnivores get separate platters, whether there’s two of you or ten. This type of dining isn’t for everyone – what if your dining companion is a sloppy eater? – so you have to get into the spirit and be game for it. Eritrean dining is all about conviviality; so Mosob isn’t really the place for a solo diner, a terse business meeting or a nervous first date. 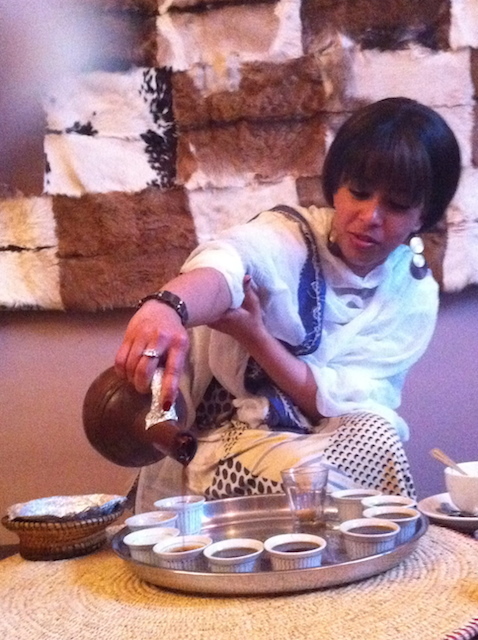 A visit to an Eritrean restaurant isn’t complete without the traditional coffee ceremony. Fresh coffee beans are roasted in a small saucepan, brought over to the table and wafted around under the noses of each diner so that you can inhale their sweet aroma. The beans perfume the room so magnificently that you’ll get envious looks from other diners. A big bowl of warm, lightly salted, freshly popped popcorn arrives next; followed by a tray laden with a traditional African coffee pot, tiny coffee cups and burning frankincense. More heady perfume. The incense has a religious significance and purifies the air – but why the popcorn? Because drinks are always served with nibbles – it’s a sign of hospitality – and also it’s akin to, say, cocktails with bar snacks, or beer with peanuts. Moreover, elderly Eritreans – for whom a relaxed, unhurried coffee ceremony is an extremely important social ritual – believe that throwing popcorn in three directions gets rid of negative vibes from a room. There are no negative vibes in the small dining room here, however; just an imaginatively decorated space designed by the siblings, with a small bar for dispensing drinks and a larger function room at the back. Arty Eritrean knick-knacks are dotted around, including carved wooden sculptures, beaded ornaments and framed pictures. Although there’s no formal ‘sittings’ system as such, bookings are staggered over around 2-3 hours’ time slots, so that the tiny kitchen can cope. We didn’t feel rushed at all though – far from it – and wouldn’t have known about this had the staff not told us. We paid approximately £30 each for set veggie menu, drinks including fresh mint tea and cachaça-based cocktail, own-made wonderfully fresh, sticky and syrupy pistachio-studded baklava (not part of the set menu), coffee ceremony and service. 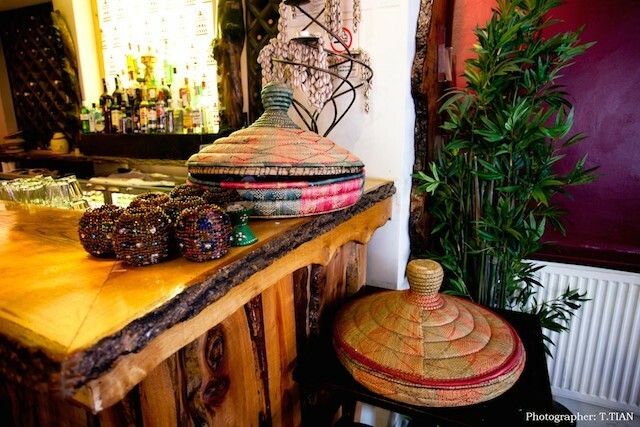 And it’s the service – more like warm hospitality at a friend's house – that sets Mosob apart from London’s other Eritrean restaurants. There’s a lot of bantering from good-natured staff, who jovially test your knowledge of the country, share little nuggets of information about the culture and customs – or simply leave you alone if need be. Food, as we all know, is more than just about food – that is, the taste of random ingredients cooked together. It’s about history and heritage, love and sharing; a glimpse into another life, a family story, a different culture. And nowhere more so than at Mosob. Mosob, 339 Harrow Road, W9 3RB. Tel: 020 7266 2012. We review strictly anonymously, and pay for all the food, drinks and service.